Large 25 Square Grid Office Pool 24" x 32"
This is a 25 Square Grid, we also have the 50 Square and the 100 Square versions available. This is not our Scratch-Off product, please go here for the Scratch-Off Squares. The grid is printed on high quality, heavyweight stock gloss paper! This is a 25 Square Grid Office Pool that can be used for any game of the season. For orders of more than 20 please contact us for a quote! Mix & Match this grid with any of our other grids or brackets and still receive the discounted bulk pricing! Please email us with the quantities you need and we will prepare an invoice! 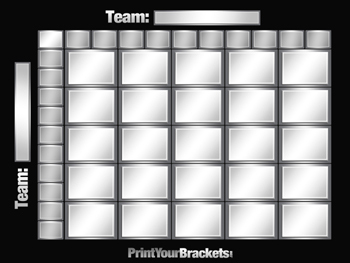 Choose from any of our 18 different tournament brackets. Available in both single and double elimination. The brackets are printed on high quality, heavyweight paper! Try our unique 100 Square Grid Scratch-Off Sheets. 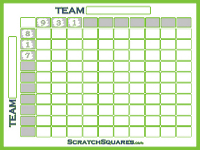 Once all 100 squares are full simply scratch off the covering to reveal the random numbers that will be used to represent each team's score. 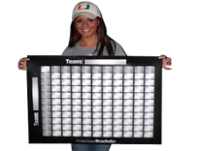 Our uniquely designed, 24" x 32" high resolution Square Grid Office Pool is perfect for the Super bowl or any other game of the season! Available in 100, 50, and 25 square versions.